A view of the present Town Hall in the 1830s. 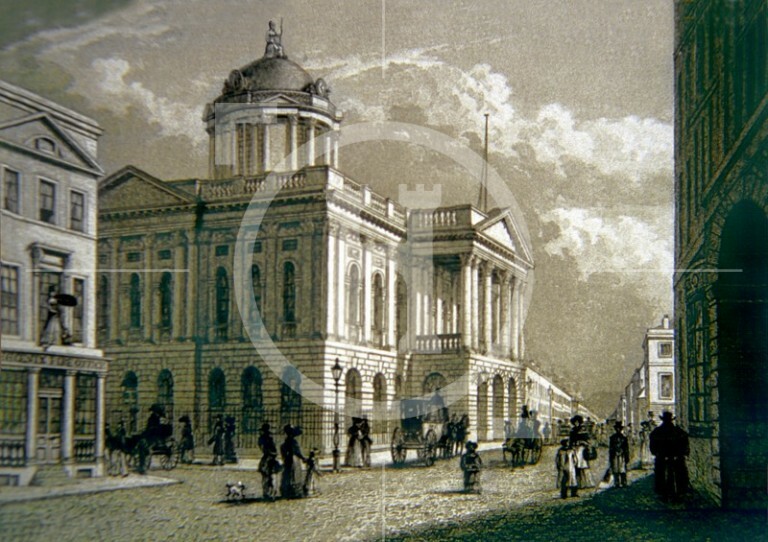 In 1749, the present Town Hall was begun, on what was then the corner of High Street and Water Street. In its first form it was a square building around a central well or court, the lower storey being as before an arcaded passage intended for the merchants and traders to walk in. The upper storey contained the town Hall properly so called, with the Council Chamber, sessions room and assembly room. A stunted dome with a cupola rose above the front entrance. It was opened in 1754. In 1787 the buildings which crowded up to it on the north and west were removed and a large addition, with a new assembly room, was built on the north side; the distinction between this and the older part is still obvious.